Why describe the lowliest of the servants in a Regency household first? Because heretofore so much has been written about the butler and the housekeeper, who, along with the stewart, stand on top of the servant food chain. We know them by heart and they are no longer mysterious. A scullery maid’s life was generally one of drudgery and servitude, She arose very early in the morning (often at 5:00 or 6:00 a.m.) and after a day of scrubbing and carrying water and heavy pots, she would stumble into her simple attic bed at 10:00 p.m.
You must rise at six o’clock and wash and dress, with your hair tied neatly back beneath your cap. Your bed must be made and you must be downstairs at work within half an hour of waking. You first task of the day is to stoke the Kitchen range to a good heat, to boil water for early morning tea. You must then empty the chamber pots of all the female Servants, and wash them around with a vinegar soaked rag kept only for this purpose. You should also assist the Lower Servants in preparing the early morning tea for the Upper Servants. You must then set about cleaning the Kitchen passages, the Pantries, the Kitchen and Scullery. When the Chef de Cuisine arrives in the Kitchen at half-past seven you will be expected to curtsey and bid him “Good Morning”. At a quarter-to eight you should lay the table in the Servants’ Hall for Breakfast. Breakfast is served in the Servants’ Hall at a quarter past eight. You should clear the table afterwards and wash the dishes. At a quarter-past nine you must appear in a presentable state, attired in a clean apron, for Morning prayers in the Main Hall. This is the only time that it is acceptable for you to be seen above stairs, and it is compulsory for all members of Staff to attend. Your duties resume in the Kitchen at ten o’clock, when you must wash up all the dishes from the Servants’ Breakfast, as well as the pans and kitchen utensils used in preparing both the Servants’ and Family’s Breakfasts. At half-past ten you should lay the table in the Servants’ Hall for tea. At eleven o’clock tea is served in the Servants’ Hall. You should clear the table afterwards and wash up. You should then assist the Kitchen Maid and Chef with preparations for the Servants’ Dinner and Family’s Luncheon, should they require you to. You must ensure the Kitchen is kept spotless at all times and continuously wash up after both the Chef de Cuisine and the Kitchen Maid as they make their preparations. At Midday you are to take your Dinner in the Kitchen with the Kitchen Maid so that you may watch over the Family’s Luncheon, whilst the Chef takes his Dinner in the Servants’ Hall with the other Servants. The Second Footman will lay the table, serve, and clear away the dirty dishes. Your duties resume at one o’clock when you must begin washing up after the Servants’ Dinner, and the Family’s Luncheon. Providing your work is done, you may have one hour at your leisure between half-past two and half-past three. At half-past three you should lay the table in the Servants’ Hall for Tea. Tea is served in the Servants’ Hall at four o’clock, you should clear the table afterwards. At half-past four, you should resume your duties in the Kitchen, washing up after the Servants’ Tea and the utensils used in preparation for the Family’s Tea. You must assist the Kitchen Maid with any food preparation for the Family’s dinner and Servants’ Supper and continuously wash up any pots and pans used. After the Family’s Dinner has been served you must clean the Kitchen Passages, Pantries, Scullery and Kitchen. Supper is served in the Servants’ Hall at half-past nine. The Second Footman is to lay the table, serve, and clear away afterwards. Providing you work is done, from half past nine until you are required to go to bed, you may enjoy your leisure. In this audio clip, a former scullery maid describes her job, which she likens to a form of slavery. (Click on the bold words to listen.) 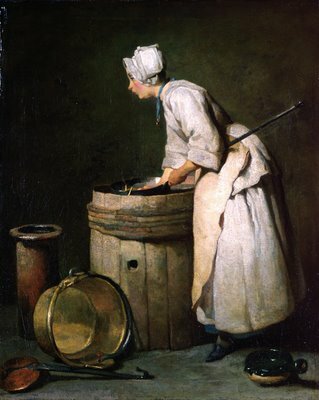 From the descriptions from several sources, I surmise that a scullery maid’s job description remained the same for several centuries, including the Georgian, Regency, Victorian, and Edwardian Eras. A modest household could often only afford a maid of all work. Such a servant worked alongside her mistress and led a hard life indeed. On this website, Hitchingbrook House: Life in an Edwardian Countryhouse describes in great detail the rules for servants as well as a typical day in 1901. Click on the bold words to enter the website.